For a differing perspective, be sure to read Mark’s portion of this two-part column on Vander Blue’s decision. Say it ain’t so, Van. That was my first reaction when it became official that Vander Blue was entering the NBA draft and hiring an agent, slashing the slight hope that he would change his mind later in the day before the official cutoff to return at 11:59 p.m. It was nothing personal. Who am I to say what a man should or shouldn’t do with his life? I’m sure he has plenty of reasons why leaving now was the best choice for him and is family so I won’t argue that Vander didn’t have the right motives. What I will argue is that he did not properly assess the big picture. You know that feeling when you’re watching a movie and one of the characters is about to unknowingly walk into some sort trap? Your stomach tightens, your fists clench and you can’t bear to watch. That’s exactly how I feel about Vander’s situation right about now. For starters it came as a huge shock to national pundits that he declared early. It’s one thing for a random fan to be caught off guard, but for literally every outlet to not even have a whiff, that’s very troubling. These guys live and breathe basketball. They watch hundreds of games in person at both the NBA and college level every year. They have sources who plug them in year round, yet you’re telling me no little birdie had chirped in their ear that this might happen? From the national media, there are two writers who I believe have the best feel about Marquette as a program: Jeff Goodman and Jason King. Both have excellent relationships with Buzz Williams and have always been fairly glowing about the Golden Eagles, particularly the past two years. How did King react? Uh oh. 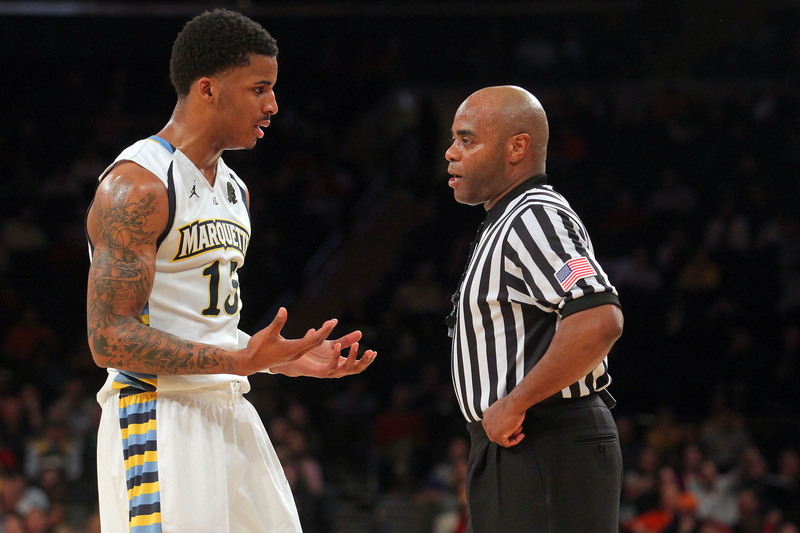 Marquette’s Vander Blue jumps into first place on my “Most Baffling NBA draft decisions” list. How about Goodman, a man with more sources than a CIA agent? Yikes, not the glowing endorsements you’d expect from two relatively friendly sources. But what do they know. Media have been wrong before, and at the end of the day, they are not the ones in position to make decisions. However, when your own coach seems surprised by the decision, it’s a glaring negative. That’s what makes it even more baffling to me. Marquette has a tremendous track record of players in the NBA since Buzz Williams was handed the keys so he would know better than most. Every player followed a similar path. Wes Matthews, Lazar Hayward, Jimmy Butler, Jae Crowder and Darius Johnson-Odom all were rewarded for exhausting their eligibility in Milwaukee either by getting drafted or by signing as a free agent, as was Matthews’ case. I’m sure he talked to a few, if not most of them, all of whom probably told him to do what he thought was best. But what he thinks is best and what NBA people think are best may not correlate. Vander showed tremendous improvement this season in almost every aspect of his game. He is betting that teams will extrapolate that continued improvement into future years. Upside becomes the buzzword of choice around this time. Yet, Vander would be better served showing rather than telling. Had he stayed in college and continued the current trajectory he will be peddling to scouts, we’d be talking about him as a possible first rounder instead of hoping he gets drafted at all. Like I said at the beginning, I am not one to tell him he is wrong for choosing to get paid, either in the NBA, the D-League or Europe. I don’t know his situation well enough to criticize that aspect. All I’m saying is I don’t think his base would have fallen any, if at all by waiting a year. He would still be young, he would still have plenty of talent and he could still go abroad if worse came to worse. The money would still be there. But forget about the NBA and professional basketball as a whole, that is just guess work by all involved. The most disappointing fact is Vander had a chance to become one of the all-time greats in Marquette history by coming back next year. Coming off an Elite Eight run and with loads of talent on its way in, Marquette was pegged as a preseason top-10 team in almost all the major media outlet rankings. It had a proven winner as the head coach, one of the best front courts in the nation, three top-55 recruits and a closer that had already shown his penchant for hitting big shots late in games. Vander could have led Marquette to back-to-back conference titles for the first time in school history. He would have had a decent shot at gunning for the Big East Player of the Year and even a spot on an All-America team. With two Sweet 16s and an Elite Eight under his belt, Vander would have had his best shot at a Final Four, with a title run not out of the realm of possibilities. Tell me that resume wouldn’t have stood out to NBA scouts. He has already left a remarkable legacy which can’t be taken away from him, there is no doubt about that. But very few ever have the chance to become legends. That, more than anything else, is why Vander Blue made the wrong decision.